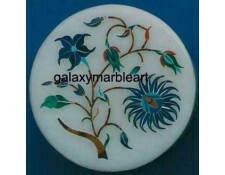 MARBLE INLAY HANDICRAFT BOXES---ROUND 3"
Boxes are very good for gifts. 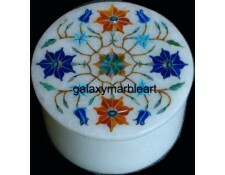 These can be used as jewelry boxes. 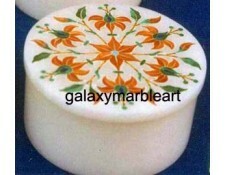 These are available in various shapes. 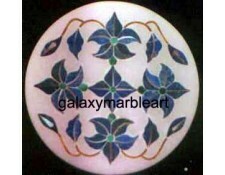 Round, octagonal ( 2 inches to 8" and bigger . 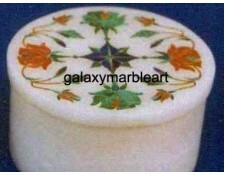 Rectangular ( 1.5x 2, 2x3, 3x4, 4x6, 6x8, and bigger). 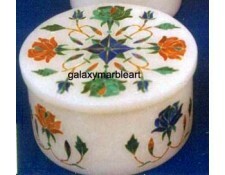 We are the manufacturer and exporter of these marble inlay boxes and produce high quality workmanshi..
A box inspired by the work from Taj Mahal in Agra,India..